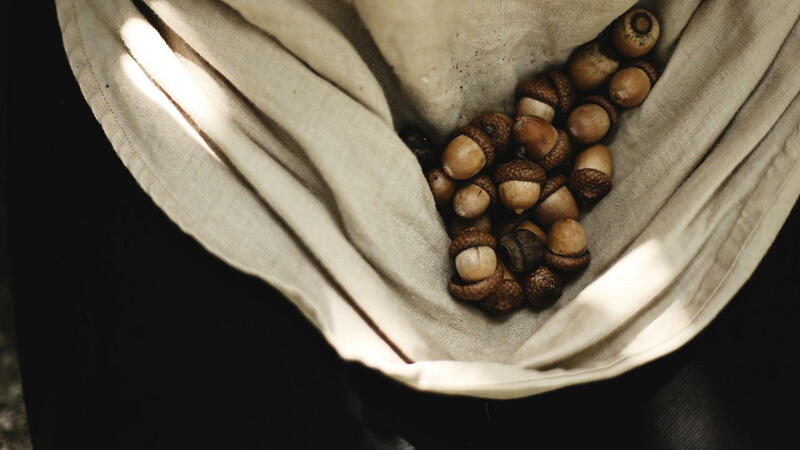 He continued to run and grab acorns, ‘til they fell out of his pockets and he had no more room to store them. I laughed because he was totally not embarrassed by his undeniable enthusiasm. And I laughed I looked just like him as I fervently collected the acorns. And then I thought I should be embarrassed by my possessiveness, as if they could really be MY acorns. I laughed again and apologized to the tree for any disrespect I may have shown. We laughed together. The tree and her acorns stayed with me. I wanted more acorns. I still want more acorns. The squirrel and the blue jay want more acorns to store for the winter months when food is scarce. Why do I want the acorns so bad? Is it that I have good survival instincts, because in a past life I collected them and made food with them when I was hungry? Is it because they are simply beautiful? A treasure of nature. Is it because I knew intuitively that every time I look at my basket of acorns I smile and feel happy? Even remembering that moment in time still makes me laugh. Is the answer really that simple? And then I wonder if the acorns fell or if they were thrown off by the mother tree. Not just let go, but actually pushed and projected toward each of us on the ground. I do remember the acorns, like little rockets, pummeling from the tree and thanking cowboy hat for protecting me. And then I wonder if the mother tree found great amusement watching each of us run after her acorns, grab them and stow them in our pockets as if she knew we would be the ones to plant the next generation of trees. That evening, on my walk by the pond, I saw lots of baby oak trees planted by the blue jays. Some are planted too close to other trees and some wont make it because of the drought, but the toughest ones will survive to become grand oak trees that will pummel acorn seeds so that little boys and big girls and blue jays and squirrels can run and play and imagine. Are you noticing the seeds of hope and new possibility pummeling around you, falling at your feet? Can you enjoy and relish the seeds and the seed collectors all around you? Or are you irritated by the little rockets falling from the sky as if they are just a nuisance? The seed’s future depends on your interpretation of its potentiality, of its higher purpose. A little rocket or a new tree? Is it your time to collect seeds or is it your time to plant the seeds that you have been holding onto?